Do you have an entrepreneurial calling and want to make a change in your career? 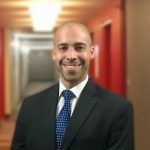 Ryan Igbanol of True North Franchising is a franchise and small business coach who helps professionals work through the transformation from employee to employer. Contact Ryan today to discuss your options!